Jader Perez during his speech Friday. Jader Perez brought a whole gym full of people to their feet in a spontaneous standing ovation Friday. Jader is a maintenance worker at Mount Mercy University. 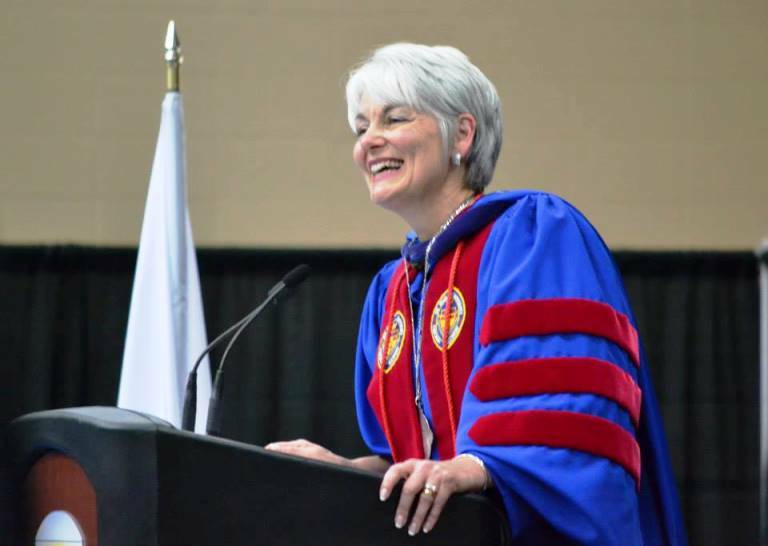 He spoke on behalf of staff at the inauguration of President Laurie Hamen, who began work in February, but was officially and ceremoniously installed in office during the Friday festivities that fittingly also capped Mercy and Mission Week. An inaugural ceremony is usually full of applause anyway. But, I think Jader surprised himself and everyone else when his, one of a long line of “charges” to the new president, brought an intense reaction. You see, Jader first came to MMU as a student and to play baseball. But marriage, family—in short, life—got in the way and he dropped out. 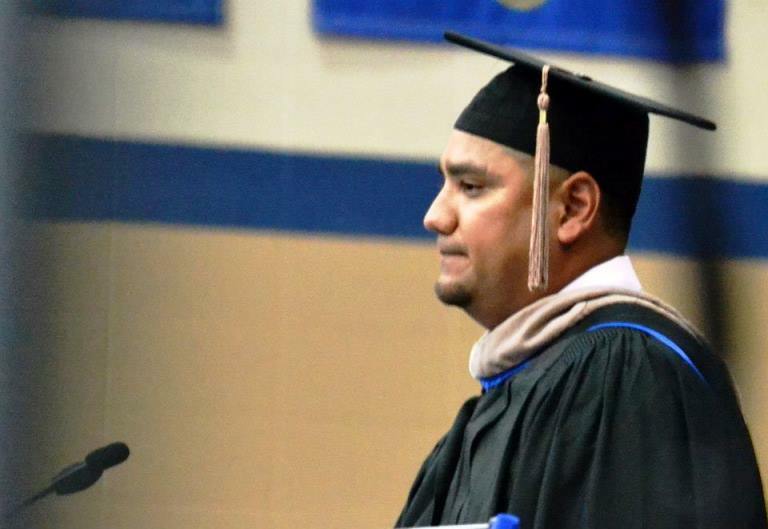 He continued working at the university as a custodian, but his mother asked him to promise her that he would someday go back and finish his college degree. 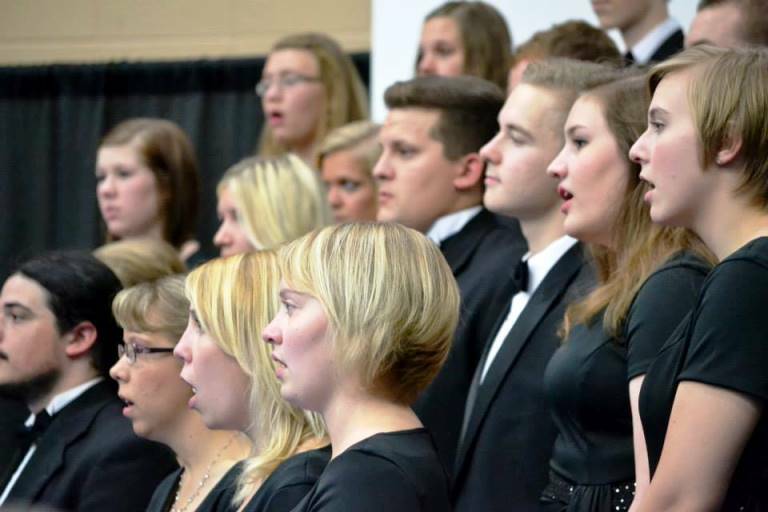 Choir sings at inauguration. They sound great this year–can’t wait to hear them at World War I finale Nov. 11. After several years, Jader began attending classes again, this time in the “Advance” evening program, designed for working adults. And “someday” finally came this summer, with Jader earning his business bachelor’s degree. His mother didn’t live to see it. He choked up a bit during his speech as he said that, but he noted that he still knows she is proud of him. He finished his charge to the president and walked back to his seat—and we all sprang to our feet with a spontaneous and enthusiastic ovation. Jader showed his appreciation by looking down and patting his heart. It was indeed a heartwarming speech. President Hamen, as would be expected, made extensive remarks. Her focus was on “courage” as she reminded the audience of the history of the Sisters of Mercy and the founding of Mount Mercy. Just as the sisters found a road forward in those harsh times and Mount Mercy grew and changed, it faces uncertain times again today. But Hamen reminded the audience that the education of the whole person—the growing of souls—is part of MMU’s continuing mission and reason it is still relevant. She referred to a recent book about the problem of this country’s elite colleges focusing too much on knowledge and skills and not enough on the whole person. 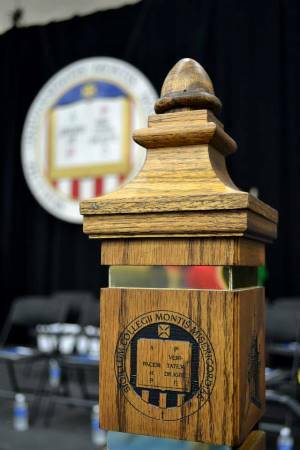 The Mount Mercy “mace,” made by retired art professor Bob Naujoks from wood that was part of Warde Hall, MMU’s original building. Warde Hall still stands even without this wood in it, my office is 101 Warde Hall. As Hamen drew to a close, she compared Mount Mercy now to when it was founded. It was a fine, inspiring speech, delivered well despite the heat in the gym that also made it a perspiring speech. I was feeling pretty good and I still do. But that feeling was slightly muted when the next event happened. My newspaper arrived on my doorstep Saturday. On an inside page, under a nice photo of our new president, a Gazette reporter took 435 words to describe the inauguration. Except, to a large extent, the reporter didn’t actually cover the here and now—The Gazette was stuck 16 months in the past. Of those 435 words, 205 were devoted to a rehash of the end of the previous president’s term. For another measure of the strange balance in the story, out of 13 paragraphs, fully six were centered on the subjects “Blake,” the previous president; or “Graham,” the previous provost. Now, I suppose the Gazette can be grumpy about the full story of a change in leadership not being told by MMU. But, it was 16 months ago. Children born then can walk and talk now. The extensive focus on the past was odd. It’s not the only odd reporting I’ve observed in The Gazette recently. On Sept. 16, it reported on fall enrollments at area colleges. That story was 25 paragraphs long. Paragraphs one through four were about Coe College, enrollment 1,340. Paragraphs five through seven were a roundup of various colleges. Paragraphs eight through 16 again centered on Coe. And finally, paragraphs 17 through 23—seven buried paragraphs in 25—described enrollment at Mount Mercy, with 1,762 students. Cornell, a college in Mount Vernon, got paragraphs 24 and 25. 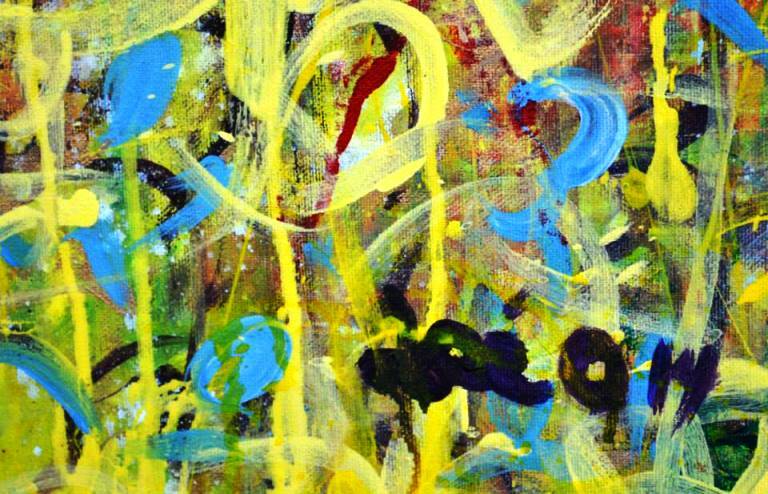 Detail of painting by art professor Jose Clemente presented to Hamen at the ceremony. Coe had record enrollment and MMU didn’t. But then again, why does the college with 1,340 students rate so much more space and attention than the university with 1,762 students? We’ve been bigger then Coe for a number of years, but it feels like The Gazette sometimes thinks of Mount Mercy as an afterthought. And when it does think of us, it sometimes would rather focus on its archives then cover what is happening now. Mentioning Blake and Graham in the story of Hamen’s inauguration—and noting the cloudy circumstances under which both left simultaneously in 2013? That was factual, understandable and fair. What’s odd is the focus—almost half of the story—on the rehash.